The Editorial Board governs Shakerite opinion coverage, writes routine "Rite Idea" editorials, and serves as a guiding force for The Shakerite on controversial coverage. It was elected from and by the Shakerite Staff in September 2018, after speeches and online voting. Emilie Evans, a two-term board member and current executive managing editor, was elected Board Chairwoman. 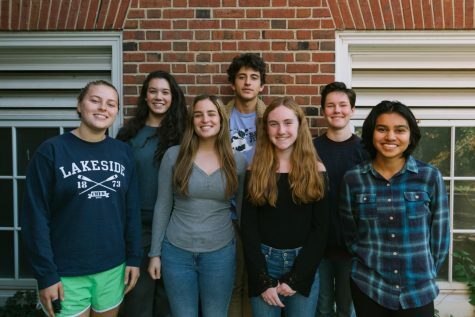 The Editorial Board 2017-2018 comprises appointed members Emilie Evans (Executive Managing Editor), Astrid Braun (Editor-in-Chief) and Ainsley Snyder (Opinion Editor) and elected members Mae Nagusky (Web Managing Editor), Emet Celeste-Cohen (Print Managing Editor), Lauren Sheperd (Education Columnist) and Ashley Sah (Social Issues Investigations Reporter). Campus and City Community Reporter Danielle Krantz and Raider Zone Editor Anna Krouse serve as alternates. With certain editorials, other staff or community members may participate in editorial meetings to provide information that may be useful. The Board's editorials, called "The 'Rite Idea," present the views of the editorial board; however, they may not reflect the opinions of The Shakerite's entire staff. The Editorial Board's Charter is accessible here for the public to view.